A Labour shadow cabinet minister’s description of Sir Winston Churchill as a ‘villain’ has been criticised as a ‘stupid thing to say’ by the wartime prime minister’s grandson. Churchill led the country from 1940-45 and then again from 1951-55 and was voted number one in a 2002 BBC poll of the 100 Greatest Britons of all time. He was referencing the Tonypandy riots in Wales in 1910 where miners went on strike and wrecked town centre shops. Churchill, as the Lib Dem home secretary, was in charge of handling the Government’s response. 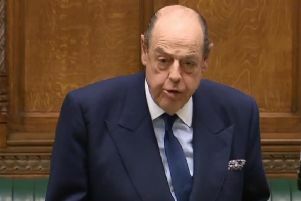 Mid Sussex MP Sir Nicholas Soames, Churchill’s grandson, criticised Mr McDonnell’s comments. He told the Telegraph: “Frankly it’s a very foolish and stupid thing to say, surely said to gain publicity.